On 25 June 1942 a company of American engineers landed at Milne Bay to construct an airstrip for a forward base for air strikes against Japanese positions in New Guinea. From late July, Kittyhawk fighters of 75 and 76 Squadrons RAAF and Hudson bombers of 6 and 32 Squadrons RAAF were based at Milne Bay. To guard the base, two Australian infantry brigades, with attendant artillery and other support units, were sent to Milne Bay. These included the 7th Brigade (9th, 25th and 61st Battalions), the 18th Brigade (2/9th, 2/10th and 2/12th Battalions) and the 9th Battery, 2/5th Field Regiment. By mid-August 7,500 Australians and 1,400 Americans were at Milne Bay under the overall command of Major General Cyril Clowes. Milne Bay suffered its first air raid on 4 August with a heavier raid a week later. A Japanese invasion of Milne Bay was expected and allied shipping was ordered to Port Moresby. An invasion force of three Japanese cruisers, two large transport ships, two tankers and two minesweepers was sighted on 25 August but despite the best efforts of the RAAF, little damage was done to the invasion force. On 26 August, the Japanese landed and advanced along the north shore of Milne Bay towards the airstrips. Kittyhawks smashed many landing barges making it impossible for the Japanese to undertake water borne flanking movements along the coastline of the bay. Much equipment and ammunition was also destroyed. The Kittyhawks were supported by USAAF bombers operating from Charters Towers, Queensland and an American bomber sank one of the Japanese transport ships as it retreated out to sea. The 25th, 61st and 2/10th Battalions bore the brunt of the early fighting against the Japanese advance while RAAF Kittyhawks and Hudson bombers harassed the Japanese. The Japanese used 29-30 August to regroup and await reinforcements. The Australians prepared for the next Japanese attack which commenced at 3 am on 31 August 1942. The Japanese were unable to make headway and were forced to retreat. 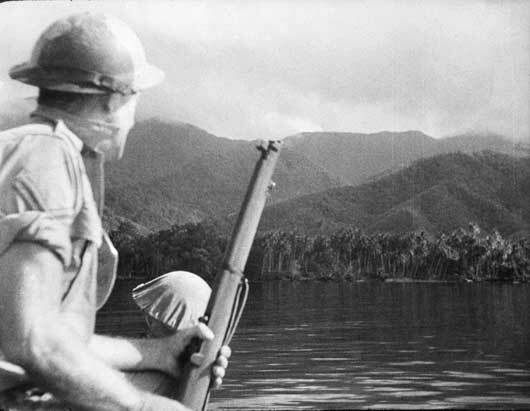 Between 1 and 6 September, the Australians pressed forward against Japanese positions along the north shore of Milne Bay, gradually driving the enemy back to the initial landing site of 25 August. During those days the strafing of the RAAF Kittyhawks and the fire of the 2/5th Field Regiment supported the infantry. As they pulled back, the Japanese put up a hard fight. On the afternoon of 4 September 1942 near Goroni, Corporal John French, finding his section held up and pinned down by the fire from three enemy machine guns, ordered his men to take cover. He then went forward alone and silenced one of the guns with grenades. Then, armed with a Thompson sub- machine gun, he charged another post firing as he went. Although badly hit, he continued his attack and his men heard the enemy gun fall silent. When they came up they found French dead in front of the third enemy post. Corporal John French, 2/9th Battalion, of Crow’s Nest, Queensland, was awarded a posthumous Victoria Cross for his bravery. An image that is typical of the country around which Australian militia forces repulsed Japanese attempts to land (AWM 013315). 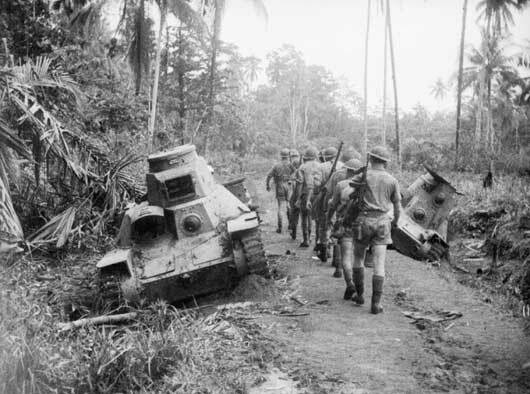 An Australian infantry section passing Japanese light tanks knocked out at Milne Bay (AWM 013320). 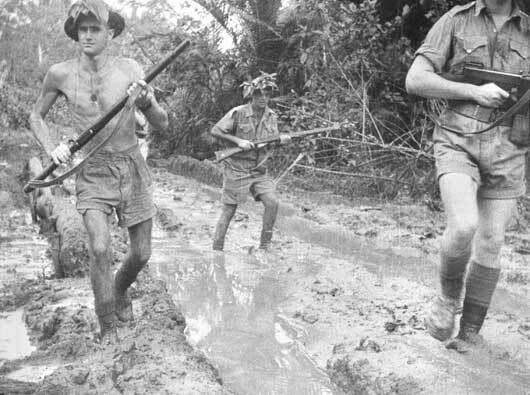 Australian troops plough through the mud at Milne Bay shortly after the unsuccessful Japanese invasion attempt (AWM 013335). 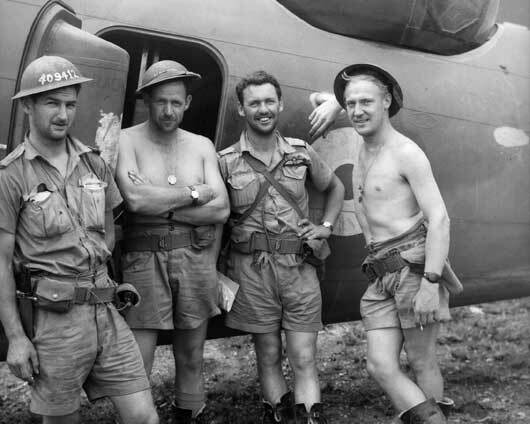 The happy crew of a 6 Squadron RAAF Lockheed Hudson after their return from attacking Japanese destroyers which had been shelling Australian positions in Milne Bay (AWM 026596). 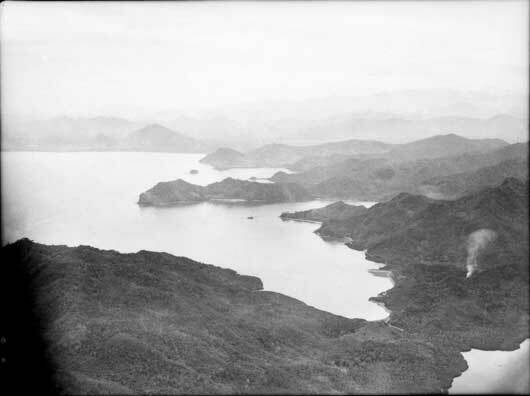 Mullins Harbour, Milne Bay, where the Japanese attempted to land (AWM 026600). 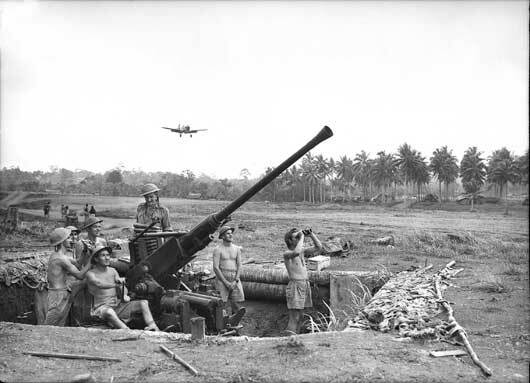 A Bofors 40mm anti-aircraft gun on the main fighter runway at Gili Gili airfield (AWM 026629). 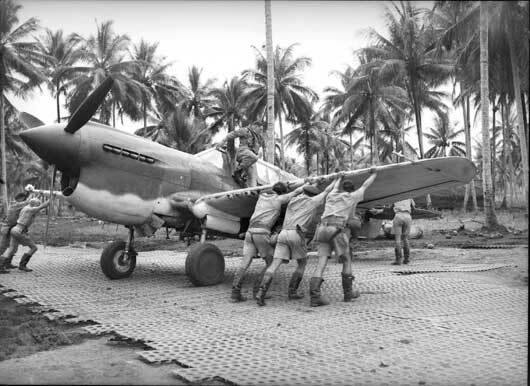 Fellow pilots of 76 Squadron RAAF lend a hand to push Squadron Leader Truscott's plane back into the dispersal bay as he steps out of the cockpit (AWM 026648). 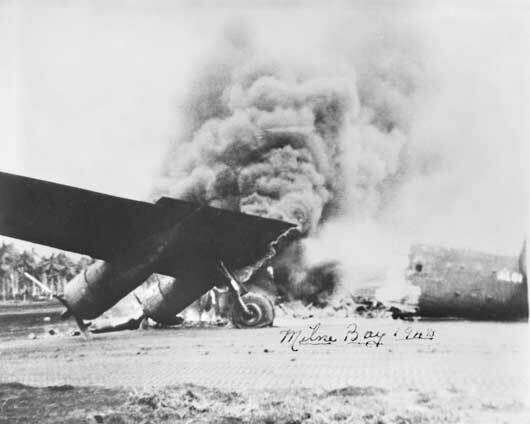 An American Liberator aircraft, which made a forced landing at Milne Bay, set on fire by Japanese dive bombers (AWM 044665).